Enthusiastic & informative! Experience Bob's extensive collection of fossils including dinosaur footprints, jelly fish, a woolly mammoth tooth, and dino poo. 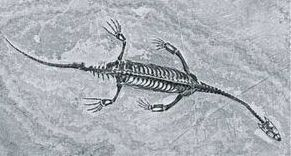 Bob’s exhibit covers the many different ways of fossilization, laws on fossils, pseudo fossils, living fossils, extraction of fossils, fake fossils and more. The types of fossils on display are, Dino Eggs, Dino Coprolite, Dino footprints, Petrified wood, Amber, Carbonized leaves, Volcanic ash fossils, Insects, Mammoth tooth, Fossilized fish up to 71 cm long, Ammonites, Trilobites, Starfish, Soft bodied fossils like jelly fish, Crinoids, Fossilized crabs, Reptile incased in limestone, a Megalodon tooth and more. Click here for details about this speaker. An attention grabbing, fast paced and entertaining presentation! 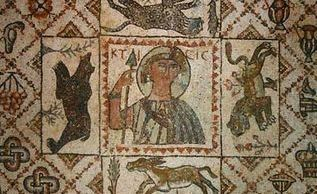 George will discuss the use of stone in mosaics and how this has been applied to art and decorations. Starting with prehistoric references about 100,000 BC, bringing it into the neo-lithic and then the great cultures of Egypt, Greece and Rome. Mosaics are a permanent art form. During the Renaissance, the art form of Commesso was developed by the Medici. Also hear about the Indian/Moghul and Byzantine forms and style. Learn how marble developed into a decorative industry and how technology, with computers and water abrasive cutting technologies have made Stone Art Pietra Dura available to all. George will also talk about Pebble Mosaics as stone art that you can do at home and for community projects. Many people are not aware that Ontario's mining industry began in the south, with discoveries of iron and copper in the early 1900's, gold in 1866 and stone quarrying for construction of the Rideau and Welland canals over 150 years ago. Phosphates, fluorite, graphite, corundum and other industrial minerals were mined from the early 1800s to the mid 1900s. Mining is still an important industry in southern Ontario, as you will see during this informative presentation. The importance of mining to southern Ontario’s economy and society, past and present. 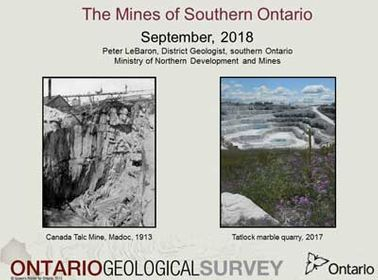 Southern Ontario’s geology and geological history, from a continental margin, through a Himalayan-scale mountain chain, and back to a shallow ocean setting – the source of our limestone, gypsum and salt deposits. Our world-class (and some smaller) mines: production, exploration and recent developments. We are all attracted to certain foods, smells and crystals. There is a reason for this. It's our body trying to bring itself to a level of equilibrium. Each crystal or gemstone has its own healing quality. This connection to the body and the bodies chakras is important to understand. Each chakra is connected to a stone and has a vibrational frequency that allows the body and gemstone to work together to help the body achieve holistic health naturally. Attraction to a gemstone/crystal or colour is your body telling you there is a blockage in one of your chakras or energy points in your body. Those attractions are the body giving you clues on how to repair itself. At the seminar we will discuss one stone per chakra to receive some basic information that can be used in your daily life as a pocket stone, in an elixir and in mediation or for just general holistic health. 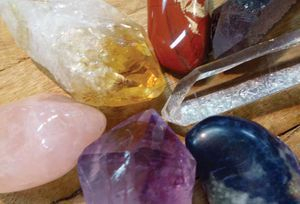 Understand how crystal quartz, amethyst, sodalite, lapis lazuli, aventurine, rose quartz, citrine, carnelian, red garnet, selenite and black tourmaline can help bring you balance in your daily life.